C. An immunofluorescence assay on D10 parasites expressing MitoEFG-HA reveals that PFL1590c is localised to the P. falciparum mitochondrion. MitoEFG-HA (green) co-localises with MitoTracker labelling of the mitochondrion (red). DNA stained with Hoescht 33342 (blue). 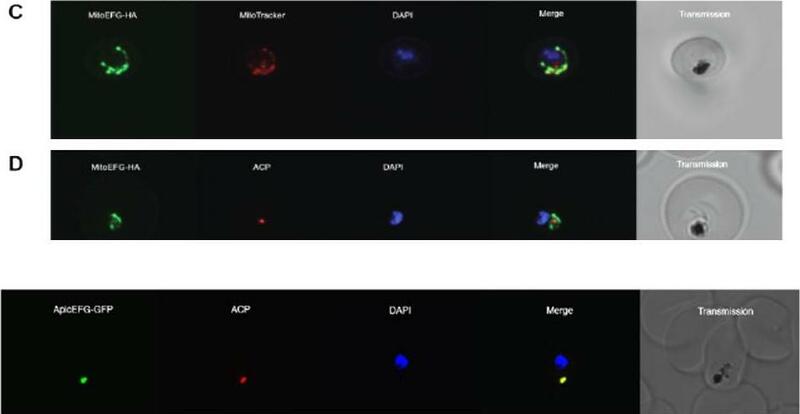 D. An immunofluorescence assay on the MitoEFG-HA expressing parasites counterstained with the ACP antibody as an apicoplast marker. MitoEFG-HA protein localises to the typically elongated mitochondrion (green), but does not co-localise with the punctate apicoplast (red). DNA stained with Hoescht 33342 (blue).Lower row: PFF0115c was fused to a C-terminal GFP tag to create the construct ApicEFG-GFP. An immunofluorescence assay on D10 parasites expressing ApicEFG-GFP reveals that PFF0115c is localised to the P. falciparum apicoplast. ApicEFG-GFP (green) co-localises with ACP labelling of the apicoplast (red), and shows the dot-like organelle typical of the P. falciparum apicoplast during the ring stage of the asexual cycle. DNA stained with Hoescht 33342 (blue).Johnson RA, McFadden GI, Goodman CD. Characterization of two malaria parasite organelle translation elongation factor g proteins: the likely targets of the anti-malarial fusidic Acid. PLoS One. 2011;6(6):e20633. Synchronised ring-stage parasites expressing RFP targeted to the apicoplast (red) and YFP targeted to the mitochondria (green) . The nuclei were stained with Hoescht 33342 (blue) and viewed by confocal laser microscopy.PFL1590c is a nucleus-encoded mitochondrial-targeted EF-G protein involved in P. falciparum mitochondrial translation. PFF0115c is a nucleus-encoded apicoplast-targeted EF-G protein involved in P. falciparum apicoplast translation.Johnson RA, McFadden GI, Goodman CD. Characterization of two malaria parasite organelle translation elongation factor g proteins: the likely targets of the anti-malarial fusidic Acid. PLoS One. 2011;6(6):e20633.